The Egyptians really seemed to have it all. They built the astonishing pyramids, crafted volumes of myths, and lived along the gorgeous, if not tempestuous, banks of the River Nile. As with any ancient culture, the Egyptians used mythology to try to explain the world around them. While some myths explained nature's phenomena, others were told to make sense of the human condition - death and dying, love, deceit, and treachery. Regardless of their aim, myths are full of beautiful symbolism, often touting some virtue or human quality to aspire to. Students across the globe continue to pore through volumes of ancient mythological tales, and with good reason. They tell us so much about our ancestors. 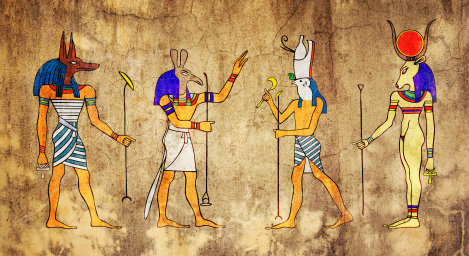 Let's take a look at some popular myths told by the Egyptians. Not only is Ra credited with creating all the gods of the earth, he also traveled across the sky every day as the sun. At night, Ra would journey to the underworld, defeating the allies of chaos. Ra also ruled on Earth as the first Pharoah. Egyptian kings claimed they were descended from Ra, thus giving credence to their seat on the throne. They called themselves "The Son of Ra". Isis and Osiris were two of the four children of Nut, the earth goddess. Isis and Osiris were married. As the eldest child, Osiris ascended the throne and the people loved him, but his brother, Set, was jealous of this and sought revenge. Set killed Osiris, cut him into pieces, and disperse the pieces all over Egypt. Isis, however, had great magical powers. She traveled across the land, collected all the pieces of Osiris, breathed life back into them, and resurrected him. Soon, they conceived a child together, Horus, but Osiris could not return to the land of the living and went on to rule the underworld. When Horus grew to be a man, he challenged Set to the throne. A series of battles ensued but, to no surprise, Set didn't play fair and kept coming out the victor. Eventually, Isis stepped in to help Horus. She set a trap for Set, but he begged her for his life and she let him go. This infuriated Horus. His rage was so strong that it even upset the other gods. In a final match, a boat race, it looked like Horus was going to be the victor. Infuriated, Set turned into a hippopotamus and attacked Horus' boat. Yet another fight ensued and their fellow gods declared the match a tie. In the end, Osiris was consulted to see who should be king. Osiris declared that no man should take the throne through murderous ways, as Set had. In the end, Horus took his rightful place, while his father continued to rule the underworld. Ma'at was the goddess of truth, justice, and morality. She was the daughter of Ra and wife of the moon god, Thoth. She weighed the hearts of the dead to decide who should have eternal joy in the afterlife. Her Feather of Truth was the determining factor. Once placed on a scale, if the deceased's heart was heavier than her feather, they would not be permitted to journey to paradise. If the heart was deemed too heavy, a demon would devour it, causing the deceased to die a second time. Anubis was an ancient god who had many roles around death. He was initially the lord of the dead but as Osiris became more popular he took over that role. Anubis' story was then changed and he came Osiris' son and helper in the afterlife. Anubis was the protector of tombs and inventor of mummification. He was also tasked with taking the dead souls to the underworld and overseeing the weighing of the heart. The Book of Thoth contained all the knowledge of the gods. It was nestled in the bottom of the Nile and locked in a series of boxes guarded by serpents. Many pharaohs tried to gain access to it during their reign, but it was never opened. It's said that the knowledge in there was never meant to be possessed by mere mortals. Perhaps this helped the Egyptians make sense of the things they still couldn't quite understand. Somewhere - out there in the bottom of the Nile - lay all the answers. Ever wonder where Cinderella originated? Well, this is the tale of a Greek girl named Rhodopis who was sold into slavery in Egypt. A very kind man bought her and, in turn, provided her with a home and showered her with beautiful gifts. One day, an eagle swooped down and stole one of her rose-red slippers. It was delivered to the pharaoh Amasis. Amasis asked to meet the owner of that slipper and the rest, shall we say, is history. The two fell so deeply in love they even died on the same day. Pharaoh was visiting Nehern, collecting his annual tributes, when the prince of Bekhten presented him with his eldest daughter. Pharaoh accepted the princess and took her back to Egypt, making her the chief royal wife. She was named Ra-neferu. Years later, her sister Bent-Reshet became ill. The prince of Bekhten asked Pharaoh for help. He sent a physician but her illness was the work of an evil spirit. Pharaoh then went to the temple of Khonsu Nefer-hetep and asked the god to heal her. The god confronted the evil spirit, immediately causing it to leave Bent-Reshet. The prince tried to keep the powerful Khonsu in Bekhten but after three years he returned home. The prince felt ashamed for trying to keep the god there and thanked him by sending many gifts and offerings. When the tribute arrived in Egypt the pharaoh placed it at the foot of the statue of Khonsu in the Great Temple. Perhaps the human condition will continue to confound us. Even with experts in psychology, there's much we just can't figure out. The shock of a vengeful murder plot will continue to do just that: shock. Happily-ever-afters will continue to elate hearts. We humans tend to want to put things into their proper "boxes" in an attempt to understand the world and people around us. It's amazing to think that we have this in common with the same great men who built the pyramids centuries ago. "Examples of Egyptian Myths." YourDictionary, n.d. Web. 18 April 2019. <https://examples.yourdictionary.com/examples-of-egyptian-myths.html>.